by Chris Woodford. Last updated: May 23, 2018. If it turns pink, it's acid I think—you probably learned that useful phrase once upon a time, along with the second half of the same rhyme: "and if it turns blue, it's an alkali true." Measuring acids and alkalis (bases) with litmus paper is something pretty much everyone learns how to do in school. 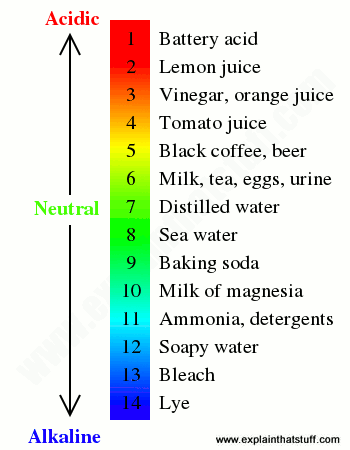 It's relatively easy to compare your little strip of wet paper with the colors on a chart and figure out how acidic or alkaline something is on what's called the pH scale. But sometimes that's too crude a measurement. If you keep tropical fish, for example, or you're a gardener with specimens that like soil of a certain acidity or alkalinity, getting things wrong with the litmus risks killing off your prized pets or your plants. That's why many people invest in a meter that can measure pH directly. What are pH meters and how do they work? Let's take a closer look! 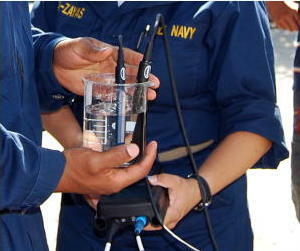 Photo: US naval hospital technicians test a water sample for acidity, alkalinity, and chlorine levels. This sophisticated two-probe, digital meter is made by Hach. It can be hooked up to a computer with a USB cable to download data from its internal memory, which can store 500 measurements. Photo by Nick De La Cruz courtesy of Defense Imagery. 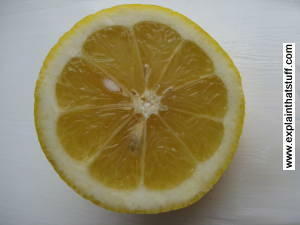 Photo: Some acids, such as lemon juice, are perfectly safe to handle; others will burn your skin and can do painful, permanent damage. If you're interested in measuring acidity, it helps if you know what it is before you start! Most of us have only the faintest idea what an acid or an alkali really is. We know it's a substance that can "burn" our skin (though it's a chemical burn, not a heat burn), but that's about it. What's even more confusing is that we can safely eat some acidic things (lemons, for example, contain citric acid) but not others (drinking a chemical like sulfuric acid would be extremely dangerous). Acids and alkalis are simply chemicals that dissolve in water to form ions (atoms with too many or too few electrons). An acid dissolves in water to form positively charged hydrogen ions (H+), with a strong acid forming more hydrogen ions than a weak one. An alkali (or base) dissolves in water to form negatively charged hydroxide ions (OH−). Again, stronger alkalis (which can burn you as much as strong acids) form more of those ions than weaker ones. Artwork: The pH scale is usually drawn running from 0 or 1 to 14. Here it is—with some everyday examples. The pH (always written little p, big H) of a substance is an indication of how many hydrogen ions it forms in a certain volume of water. There's no absolute agreement on what "pH" actually stands for, but most people define it as something like "power of hydrogen" or "potential of hydrogen." Now this is where it gets confusing for those of you who don't like math. The proper definition of pH is that it's minus the logarithm of the hydrogen ion activity in a solution (or, if you prefer, the logarithm of the reciprocal of the hydrogen ion activity in a solution). Gulp. What does that mean? It's simpler than it sounds. Let's unpick it a bit at a time. Suppose you have some liquid sloshing about in your aquarium and you want to know if it's safe for those angelfish you want to keep. You get your pH meter and stick it into the "water" (which in reality is a mixture of water with other things dissolved in it). If the water is very acidic, there will be lots of active hydrogen ions and hardly any hydroxide ions. If the water is very alkaline, the opposite will be true. Now if you have a thimble-full of the water and it has a pH of 1 (it's unbelievably, instantly, fish-killingly acidic), there will be one million times (10 to the power of 6, written 106) more hydrogen ions than there would be if the water were neutral (neither acidic nor alkaline), with a pH of 7. That's because a pH of 1 means 101 (which is just 10), and a pH of 7 means 107 (10 million), so dividing the two gives us 106 (one million). There will be 10 million million (1013) more hydrogen ions than if the water were extremely alkaline, with a pH of 14. Maybe you can start to see now where those mysterious pH numbers come from? Photo: The pH scale relates directly to the concentration of hydrogen ions in a solution, but not in a simple linear way. The relationship is what we call a "negative exponential": the higher the pH (lower the acidity), the fewer the hydrogen ions—but there are vastly fewer ions at high pH than at low pH. Suppose we decide to invent a scale of acidity and start it off at very acidic and call that 1. Then something neutral will have far fewer (one millionth or 10−6 times as many hydrogen ions) and something alkaline will have fewer still (that's one 10 trillionth, or one 10 million millionth, or 10−13 times as many). Dealing with all these millions and billions and trillions is confusing and daft so we just take a logarithm of the number of hydrogen ions and refer to the power of ten we get in each case. In other words, the pH means simply looking at the (probably gigantic) number of hydrogen ions, taking the power of 10, and removing the minus sign. That gives us a pH of 1 for extremely acidic, pH 7 for neutral, and pH 14 for extremely alkaline. "Extremely alkaline" is another way of saying incredibly weakly acidic. Photo: How do you measure the pH of soils on Mars? Simple! 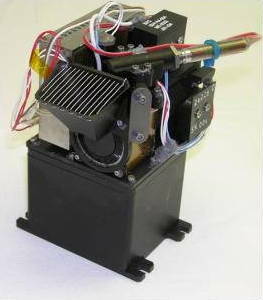 You build a pH meter into a robotic space probe. 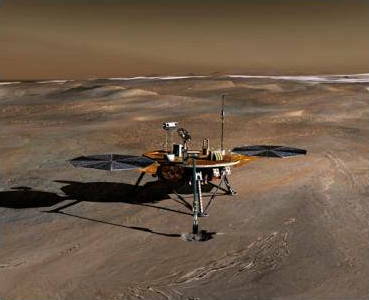 The Mars Phoenix Lander space probe (left) used this built-in, mini chemical laboratory (right) to measure different aspects of the Martian soil, including acidity and metal concentrations. Photos by courtesy of NASA Jet Propulsion Laboratory (NASA-JPL). If you're using litmus paper, none of this matters. The basic idea is that the paper turns a slightly different color in solutions between pH 1 and 14 and, by comparing your paper to a color chart, you can simply read off the acidity or alkalinity without worrying how many hydrogen ions there are. But a pH meter somehow has to measure the concentration of hydrogen ions. How does it do it? An acidic solution has far more positively charged hydrogen ions in it than an alkaline one, so it has greater potential to produce an electric current in a certain situation—in other words, it's a bit like a battery that can produce a greater voltage. A pH meter takes advantage of this and works like a voltmeter: it measures the voltage (electrical potential) produced by the solution whose acidity we're interested in, compares it with the voltage of a known solution, and uses the difference in voltage (the "potential difference") between them to deduce the difference in pH. A typical pH meter has two basic components: the meter itself, which can be a moving-coil meter (one with a pointer that moves against a scale) or a digital meter (one with a numeric display), and either one or two probes that you insert into the solution you're testing. To make electricity flow through something, you have to create a complete electrical circuit; so, to make electricity flow through the test solution, you have to put two electrodes (electrical terminals) into it. If your pH meter has two probes (like the one in the photo at the top of this article), each one is a separate electrode; if you have only one probe, both of the two electrodes are built inside it for simplicity and convenience. The electrodes aren't like normal electrodes (simple pieces of metal wire); each one is a mini chemical set in its own right. The electrode that does the most important job, which is called the glass electrode, has a silver-based electrical wire suspended in a solution of potassium chloride, contained inside a thin bulb (or membrane) made from a special glass containing metal salts (typically compounds of sodium and calcium). The other electrode is called the reference electrode and has a potassium chloride wire suspended in a solution of potassium chloride. Artwork: Key parts of a pH meter: (1) Solution being tested; (2) Glass electrode, consisting of (3) a thin layer of silica glass containing metal salts, inside which there is a potassium chloride solution (4) and an internal electrode (5) made from silver/silver chloride. (6) Hydrogen ions formed in the test solution interact with the outer surface of the glass. (7) Hydrogen ions formed in the potassium chloride solution interact with the inside surface of the glass. (8) The meter measures the difference in voltage between the two sides of the glass and converts this "potential difference" into a pH reading. (9) Reference electrode acts as a baseline or reference for the measurement—or you can think of it as simply completing the circuit. The potassium chloride inside the glass electrode (shown here colored orange) is a neutral solution with a pH of 7, so it contains a certain amount of hydrogen ions (H+). Suppose the unknown solution you're testing (blue) is much more acidic, so it contains a lot more hydrogen ions. 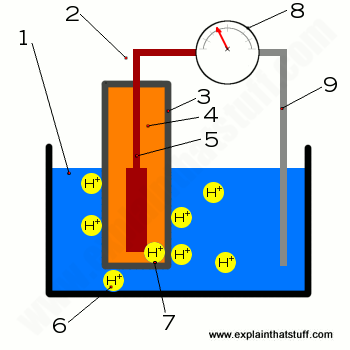 What the glass electrode does is to measure the difference in pH between the orange solution and the blue solution by measuring the difference in the voltages their hydrogen ions produce. Since we know the pH of the orange solution (7), we can figure out the pH of the blue solution. Animation: Ion exchange in action. How does it all work? When you dip the two electrodes into the blue test solution, some of the hydrogen ions move toward the outer surface of the glass electrode and replace some of the metal ions inside it, while some of the metal ions move from the glass electrode into the blue solution. This ion-swapping process is called ion exchange, and it's the key to how a glass electrode works. Ion-swapping also takes place on the inside surface of the glass electrode from the orange solution. The two solutions on either side of the glass have different acidity, so a different amount of ion-swapping takes place on the two sides of the glass. This creates a different degree of hydrogen-ion activity on the two surfaces of the glass, which means a different amount of electrical charge builds up on them. This charge difference means a tiny voltage (sometimes called a potential difference, typically a few tens or hundreds of millivolts) appears between the two sides of the glass, which produces a difference in voltage between the silver electrode (5) and the reference electrode (8) that shows up as a measurement on the meter. Although the meter is measuring voltage, what the pointer on the scale (or digital display) actually shows us is a pH measurement. The bigger the difference in voltage between the orange (inside) and blue (outside) solutions, the bigger the difference in hydrogen ion activity between. If there is more hydrogen ion activity in the blue solution, it's more acidic than the orange solution and the meter shows this as a lower pH; in the same way, if there's less hydrogen ion activity in the blue solution, the meter shows this as a higher pH (more alkaline). For pH meters to be accurate, they have to be properly calibrated (the meter is accurately translating voltage measurements into pH measurements), so they usually need testing and adjusting before you start to use them. You calibrate a pH meter by dipping it into buffers (test solutions of known pH) and adjust the meter accordingly. Another important consideration is that pH measurements made this way depend on temperature. Some meters have built-in thermometers and automatically correct their own pH measurements as the temperature changes; those are best if fluctuations in temperature are likely to occur while you're making a number of different measurements. Alternatively, you can correct the pH measurement yourself, or allow for it by calibrating your instrument and making pH measurements at broadly the same temperature. Who invented the pH meter? Whom do we have to thank for this clever stuff? First, Nobel-Prize winning German chemist Fritz Haber (1868–1934) and his student Zygmunt Klemensiewicz (1886–1963) developed the glass electrode idea in 1909. The modern, electronic pH meter was invented about a quarter century later, in 1934, when American chemist Arnold Beckman (1900–2004) figured out how to hook up a glass electrode to an amplifier and voltmeter to make a much more sensitive instrument. He was a granted a patent in October 1936. Artwork: Arnold Beckman's original amplifier pH meter from his 1936 patent. When a pair of electrodes (a glass electrode, 14, on the left, and a second electrode, 15, on the right) are suspended in the test solution (blue), a voltage (potential difference) is generated between them proportional to the pH of the test solution. This device is wired into a vacuum-tube amplifier circuit (not shown) with a simple ammeter showing the pH. From US Patent 2,058,761: Apparatus for testing acidity by Arnold Beckman et al, National Technical Laboratories, courtesy of US Patent and Trademark Office. Acids and Bases: An Introduction by Anthony Carpi. A good simple introduction to what makes things acidic or alkaline and the concept of pH. Chemguide: British chemistry teacher and writer Jim Clarke has an excellent website packed with very good, clear explanations of school-level chemistry (ideal for ages 11–18), which will be useful to older readers too. There's a section all about acids and bases that will help you figure out pH and how to measure it. Lab Math by Dany Spencer Adams. Cold Spring Harbor Laboratory Press, 2014. A basic guide to math and statistics, mainly aimed at biological scientists but also of interest to chemists. Covers everyday techniques such as calculating molarity, calibrating a micrometer, using a pH meter, etc. At the Bench: a Laboratory Navigator by Kathy Barker. Cold Spring Harbor Laboratory Press, 2005. Another guide to basic lab techniques, data collection, statistics, and analysis, including how to set up experiments, keeping a lab notebook, and running experiments themselves. Chemical Technicians' Ready Reference Handbook by Jack T. Ballinger and Gershon J. Shugar. McGraw-Hill, 2011. A huge, detailed handbook packed with helpful material on everyday chemical procedures, including a short section on pH meters. Development of the Beckman pH Meter: National Historic Chemical Landmark: American Chemical Society, 2004. The fascinating story of how Arnold Beckman came to develop his pH meter—and its impact on the world of chemistry and beyond. A Description of the Glass Electrode and its use in Measuring Hydrogen Ion Concentration by A.E. Mirsky and M.L. Anson. March 1, 1929. The Journal of Biological Chemistry, 81, 581–587. A very detailed description of how a glass electrode works. 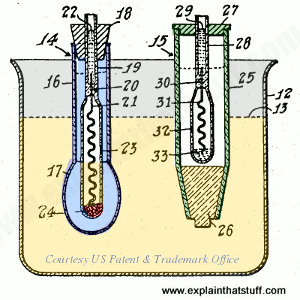 US Patent 2,058,761: Apparatus for testing acidity by Arnold O. Beckman and Henry E. Fracker, National Technical Laboratories, granted October 27, 1936. Beckman's patent (originally filed in October 1934) explains his glass-electrode pH meter in detail. US Patent 2,311,976: pH measurement and control device by Edwin D. Coleman, granted February 23, 1943. An alternative glass electrode pH meter. US Patent 3,219,556: Ion measurement apparatus and method by Edwin P. Arthur and John E. Leonard, Beckman Instruments, granted November 23, 1965. Describes an alternative method of ion measurement without using a glass electrode. US Patent 4,288,308: Continuous pH meter by Clifford C. Hach, Hach Chemical Company, granted September 8, 1981. A pH meter that can make continuous measurements over a long period of time.